Please feel free to reach out to us via email at CompetitivePathway@usta.com with any questions regarding the changes in the competitive structure. The rationale for the new professional structure for the ITF, ATP and WTA is to create an improved professional pathway that can be navigated by players who are able to compete, win and earn a living in professional tennis. This comprehensive document aims to answer questions related to the upcoming competitive structure changes. Email us at CompetitivePathway@usta.com with any further questions. View this webinar recording with Player Development General Manager, Martin Blackman and Senior Director of Competitive Pathway department, Megan Rose to learn about the changes coming to the professional tournament structure in 2019.
Review Competitive Pathway overview webinar presentation in PDF form. Beginning in 2019, The ITF WOLRD TENNIS TOUR will be the new umbrella name for all former Pro Circuit and Junior Circuit tournaments and will serve as the player pathway between the junior game & the elite levels of professional tennis. “Pro Circuit”, “Futures”, “Transition Tour” & “Junior Circuit” will no longer be used as tournament terminology. 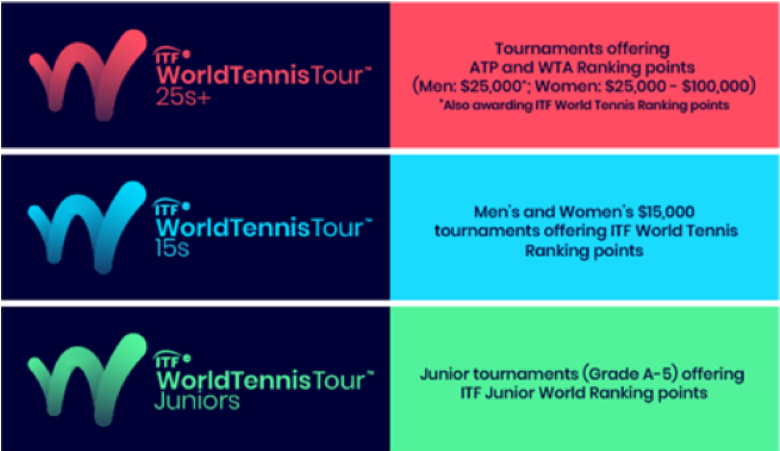 Read to find out more information on the World Tennis Tour: why change is necessary, branding, tour structure, ranking point conversion, singles acceptance, doubles acceptance and tournament organization. Visit the ITF website to learn more about the ITF World Tennis Tour. Starting the week of December 31, 2018, the ITF will fully repostion $15K tournaments to award ITF world ranking points rather than WTA ranking points. The USTA has undertaken an integrated and deliberate process to develop a formal system of wild card linkages in order to create developmental and progression opportunities for our best American* players. One of the new tournament categories created in 2019 is the National Closed events. There are 4 men and 4 women events throughout the year that are 128 draws and open to American players only. The winner of each event will win a wild card into a 15K main draw and the runner-up will receive a wild card into the qualifying of a 15K. The purpose of the event is to provide more introductory spots on the pathway and to provide opportunities for players who are otherwise not captured in the new restructure. The ITF World Tennis Tour provides entry level professional opportunities for players desiring to compete at the highest stages of professional tennis. As players compete, they have the opportunity to earn prize money and ranking points. Players earn ITF World Tennis Ranking points and/or in some events ATP or WTA Ranking points. As players having successful performances, they earn greater ranking points which assist players to move up to the next level of the professional tournament.